This website is a payment portal for customers of Stone Lake Leasing, LLC. managed by Shed Rentals. Here you can make payments and check your account information. Be aware that if you owe late fees, any payments will be applied to the late fees first. If you do not include late fees in your payment, it will be considered a partial payment and change your due date. If you have any questions or need assistance feel free to contact us via phone, text, or email. Have you thought about buying a new shed, but just don't have the budget for it right now? Are you paying too much for a secure storage unit across town, but want a more permanent and convenient storage solution? Would you like to get all that extra stuff out of your garage once and for all? 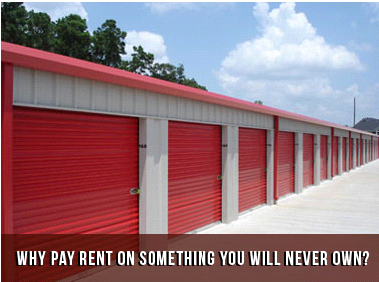 Get the storage shed you need NOW with low monthly payments and NO CREDIT CHECK required! Choose a shed from our list of rent to own models and customize it to fit your needs. Pay the first two months rent up front and we'll deliver your new shed. Make 36 equal monthly payments and you own the building outright! To calculate your monthly rental payment, simply divide the cash price of your shed by 21.6. Our rent to own program won't affect your credit score because it is not a financing program and there are no credit checks. You'll own your shed after you make the required monthly payments, so you'll save money over time if you're currently using another secure storage facility that rents space indefinitely. Pay off your shed early without penalty! 60% of each payment goes towards the cash price of the building. The rest goes to rental fees. You can pay off your building at anytime for 60% of the remaining balance with no penalties or extra charges! Return the shed if you need to, without penalties! If your situation changes and you no longer need the shed or cannot afford to keep it, simply return it with no further obligation.